I'm so excited to link up with Julie from A First for Everything for her Teacher's Pet Linky and Giveaway! First of all, here is a picture of Zoe, my first born! We aren't sure exactly how old she was when we got her-somewhere around 4 years old- but we were lucky to have her for over 15 wonderful years. She passed away peacefully a few weeks before Christmas two years ago. We were so spoiled having her as our first family pet! She was so well behaved, loved to walk on a leash, and was so sweet with our kids! 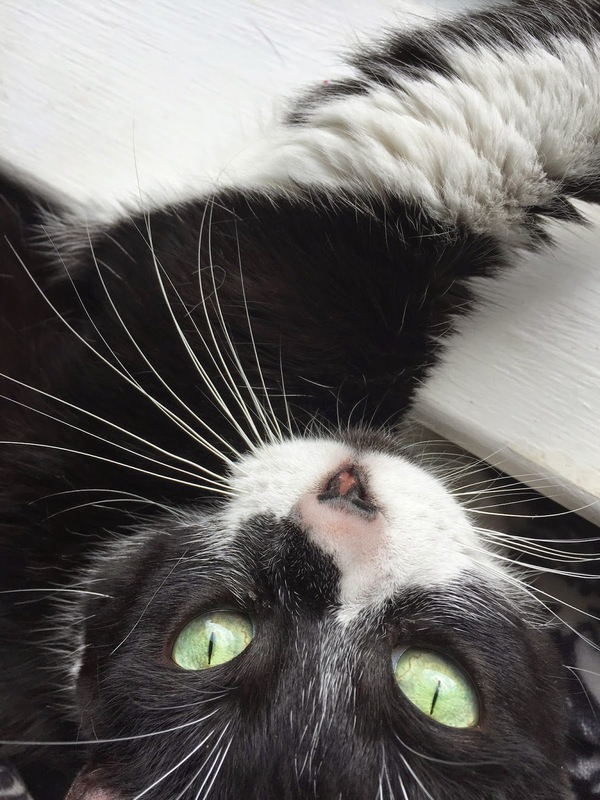 This is Oreo, who thinks she is one of the humans. She lives a life of relaxation and luxury and we are all jealous of her! She loves to be told how beautiful she is! And here is our Min Pin, Heinrich. Our neighbors originally rescued him from a shelter and named him, and when they could no longer keep him, we adopted him and kept his German name. He has my heart, but the rest of my family finds him to be quite annoying! He's really a sweet dog, and will even say "I love you" for treats! Two years ago, I bought a tiny bunny named Olive, and brought her back and forth each day to school! She was our class bunny, but since moving to my new school, I've left her at home. I think she appreciates not being dragged back and forth to school everyday! She's grumpy most of the time, even growls, (grunts) but she's super cute, so she gets away with it! 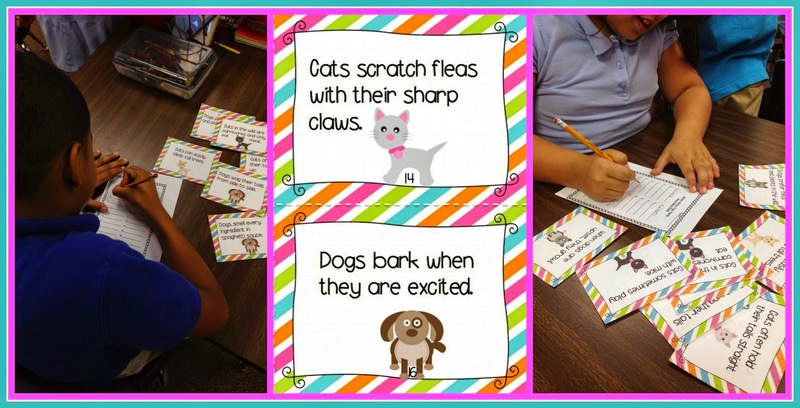 I use several pet-themed resources throughout the year. Kids love animals! These are a few of my favorites lessons. 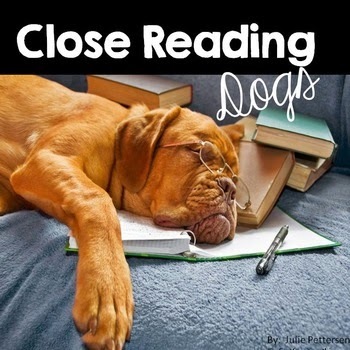 My students have loved this Dogs Close Reading pack by Julie from A First for Everything. You can click on both pictures to see this file more closely, but I love how comprehensive this pack is. 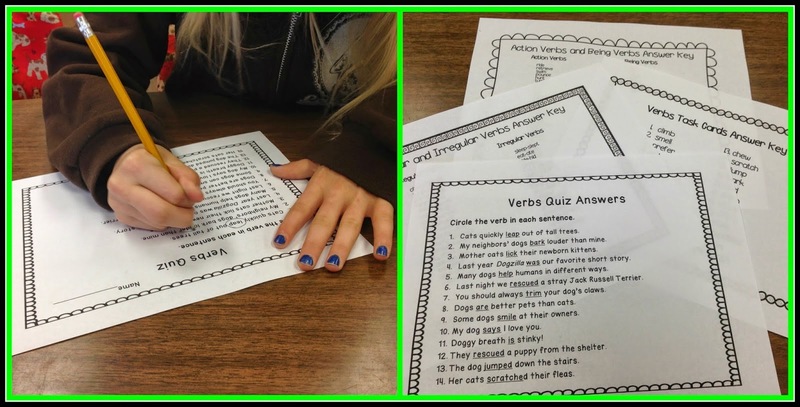 Included are text-dependent questions, compare and contrast with Venn diagrams, main idea and details, vocabulary word pages, and much, much more! 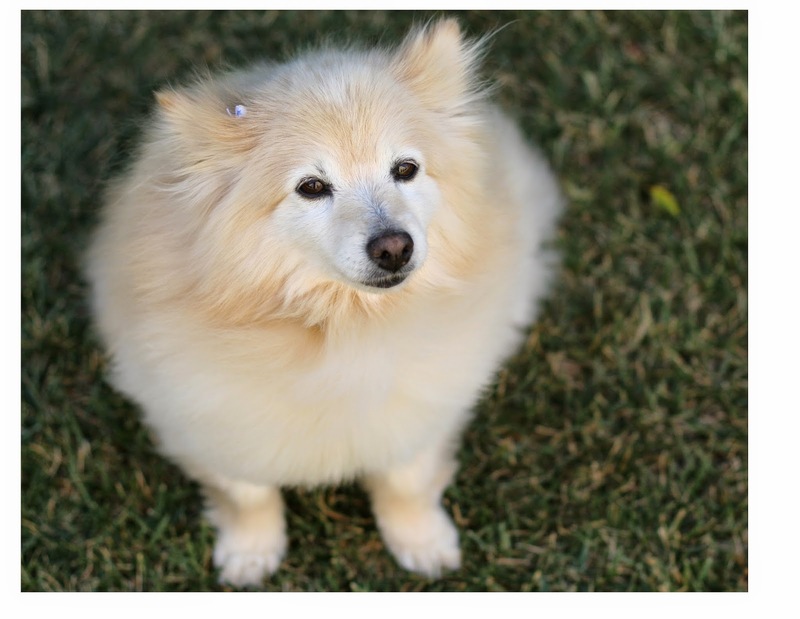 The kids love learning about the different various breeds of dogs Julie has included! Click on the pictures below to see the file more closely. 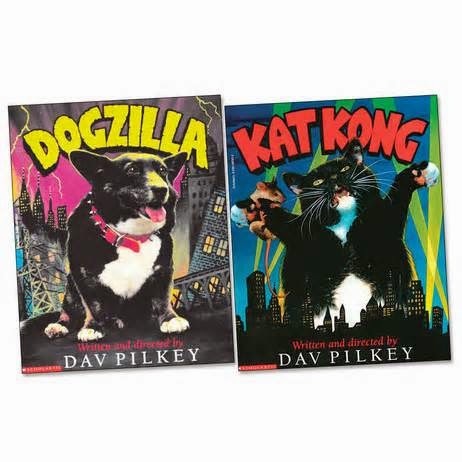 Every year we read Dogzilla and Kat Kong in third grade. My students love both stories! I made a few products featuring cats and dogs to go along with this unit. 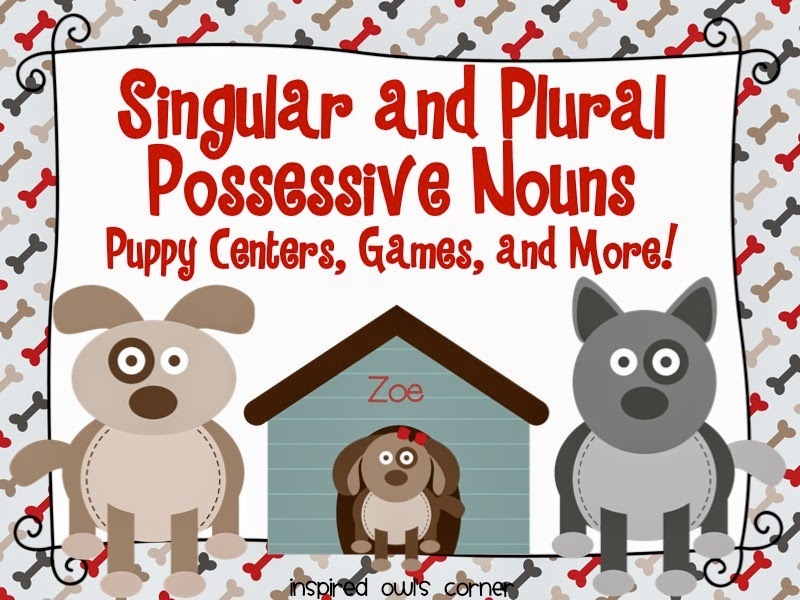 The students were practicing singular and plural possessive nouns, so I decided to make this file with a fun dog theme. 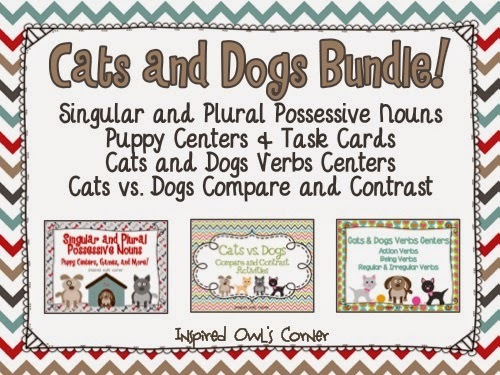 I had my students organize the dog bones and cards into singular and plural possessive piles before writing them on their recording sheets. I may have been spotted doing the happy dance inside Target when I found these dog dishes that match the colors in this file perfectly! The kids just about flipped when they saw this. They love the novelty! We use this fun Cats vs. Dogs book by National Geographic Kids to discuss compare and contrast and nonfiction text features. 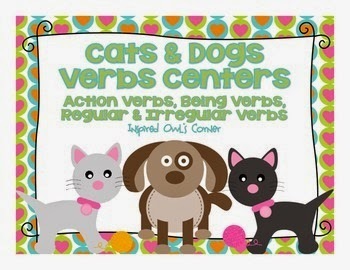 This book is perfect for teaching both concepts! 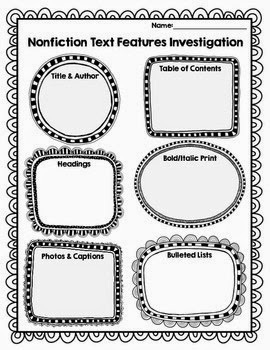 First, I taught the students about nonfiction text features and how they help us to better understand nonfiction text, which can often be more difficult for students to understand than fiction. Then we used my FREEBIE Nonfiction Text Features Investigation sheet. I told the students they were going to go on a "scavenger hunt" to find as many text features from Cats vs. Dogs as they could. You can have your students copy page numbers and/or draw diagrams for each text feature they find. Click on the picture below to grab your freebie. 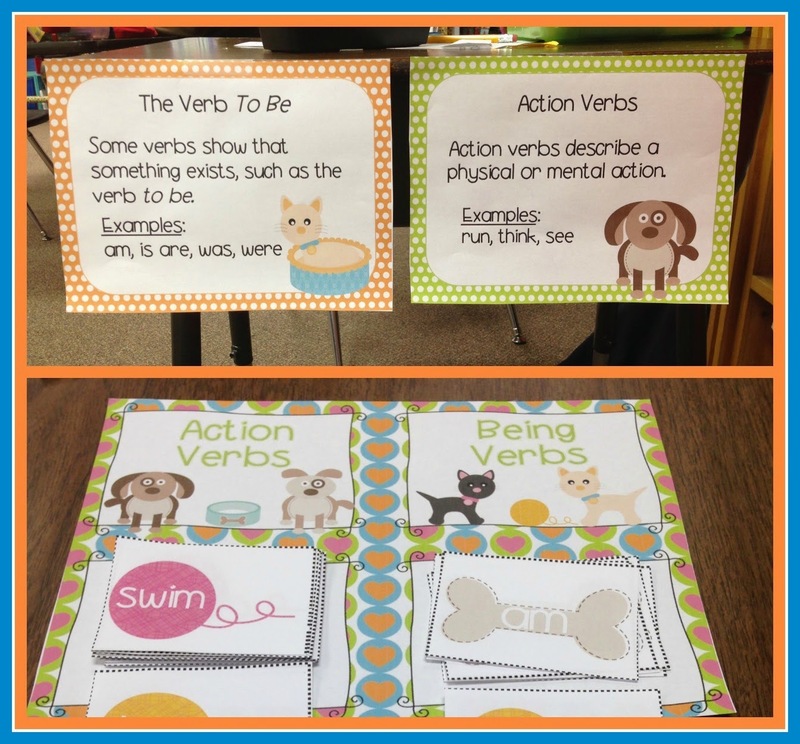 We were learning about verbs the same time we were working on compare/contrast and Dogzilla and Kat Kong, so I created a few sets of task cards to go along with the theme. Each of these files are available separately or in one large, money-saving bundle. 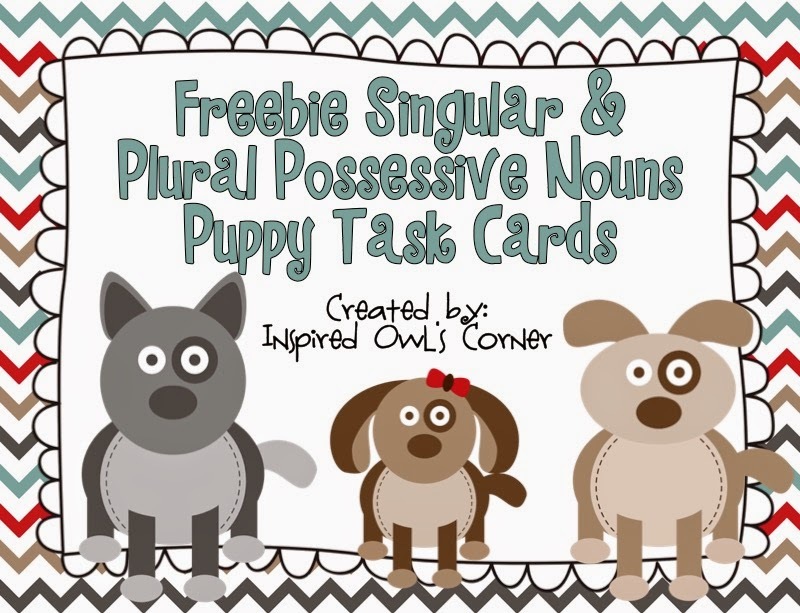 You can download a FREEBIE set of singular and plural nouns task cards from my Singular and Plural Possessive Nouns pack. Click on the picture below to see it! 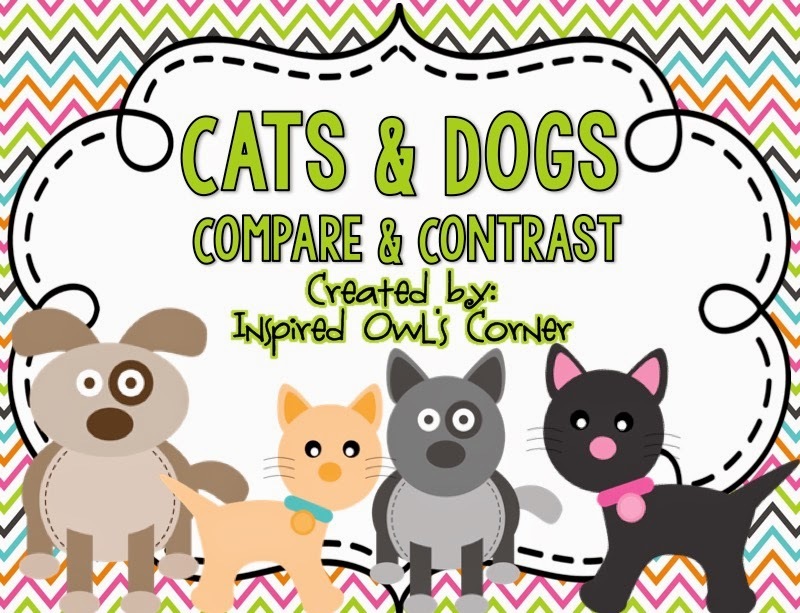 I hope you are enjoying this linky and getting lots of ideas about different ways to use pets in the classroom! Be sure to check out the other bloggers' posts for more great ideas and freebies! 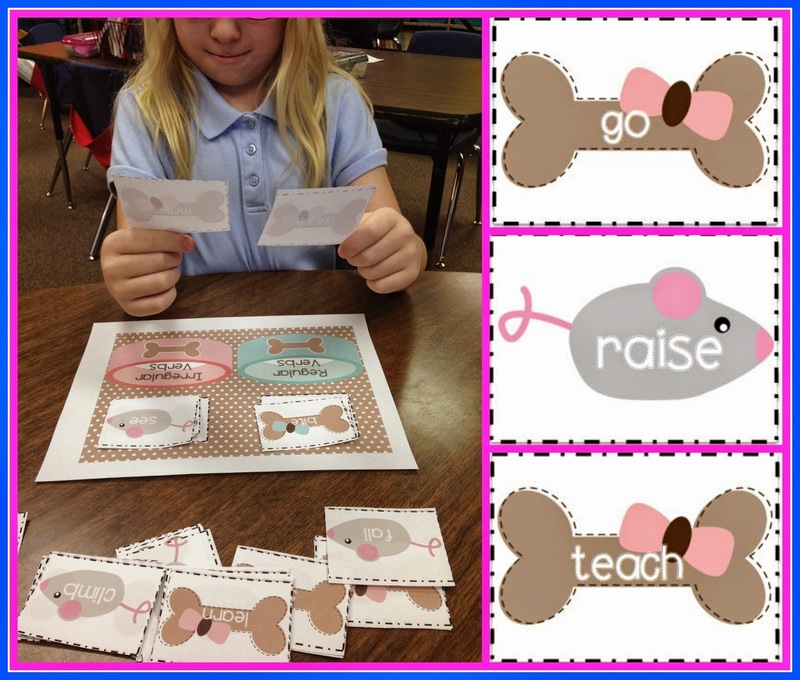 Oh my goodness I love your pet themed resources! The dog bowl idea is super cute! Your pets are adorable. Olive is precious. A bunny would never work in my house. Then noise this beagle makes when he sees a bunny.....Yikes! Thanks for linking up, co-hosting and being you! I love your pet names! They are all so cute. You got me there when you said the bunny growls sometimes because I never new bunnies could growl. But I guess if you're grumpy enough anything is possible, right! Your pets are sooo adorable! I don't know what I would do without mine! They are just like family! Thanks for sharing about yours! Thanks for hosting this linky and for sharing your stories! Wow....you have a lot of pets! 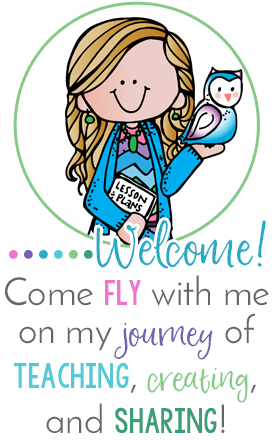 :) I am having so much fun perusing through all of the bloggers that have linked up in this linky party. The parade of pets is awesome!